Not every server migration is the same, and each one can have its own challenges and issues while some can go smooth and painless. However, hoping for a smooth file server migration and planning for the worst is probably the smarter approach for any IT admin. We have seen several customers report that they could not migrate files where they do not have NTFS permissions to. However, they were still part of the local administrators group on those windows servers. They kept receiving access denied error messages to files and folders where they had no NTFS access. 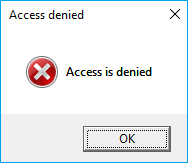 Fortunately, GS RichCopy 360 utilizes administrator override when an access denied error is exhibited. This grants us special access to read and copy the file from source to destination. This way customers were able to overcome such errors and get their migration going smoothly and painlessly. So whether you are about to migrate files and folders from one server to another or just replicating data to a disaster recovery location (DR), you should consider the tools available and evaluate all features. As part of our commitment to include cloud platforms, GS RichCopy 360 Enterprise support WebDAV as of our release in Jan 2019. Source and destination can now be a WebDAV. Our WebDAV implementation is universal. So if your cloud provider supports WebDAV then so can we. Other protocols are being incorporated and integrated into GS RichCopy 360 Enterprise. SharePoint and so many more. Feel free to let us know if you do not see a protocol or cloud technology you want supprted. Otherwise, stay tuned for more exciting features. Many of our customers choose GS RichCopy 360 Enterprise as an alternative for RSYNC for Windows. RSYNC for windows is a great tool do not get me wrong. The main problem with it is that it lacks the performance that is offered in today’s technology and the fact that it is not very intuitive to get it working properly. GS RichCopy 360 Enterprise works very similar to RSYNC and RSYCN for Windows (CwRSync) yet it is much more robust and offers many features that RSYNC lacks. 1) Robust performance using proprietary multi threading technology where several files can get copied simultaneously. What RSYNC completes in 3 hours, GS RichCopy 360 Enterprise can complete in a fraction of that time. 2) Files can be copied though a single (configurable) TCP port with the option to use AES encryption and compression or use SMB path (\\UNC). 3) Files can be replicated at block level or file level. 4) Runs as a service, can be scheduled to run at specific time and repeat on set criteria (fixed interval, every weekday, end of the month…etc). 6) Beside full automation and set it and forget it mentality, it can send email notifications when the copy job fails or successful or both. 7) Installation, configuration and working in matter of minutes. 8) Extremely easy and intuitive logical design. In addition to a powerful yet simple GUI, command line support is also supported out of the box. 9) Support for long path names, copies NTFS ACL permissions, and replicates file and folder attributes, date and time-stamps, copy open and locked files. 10) GS RichCopy 360 Enterprise is fully documented (admin guide and video library with many different examples) in addition to fully support by GuruSquad premier support. Whether you are looking for RSYNC or CwRSync, you will find GS RichCopy 360 Enterprise by far a much better alternative when it comes to data replication and data migration projects. If you are searching for an RSYNC for windows alternative, then we highly recommend that you download and trial GS RichCopy 360 Enterprise and we promise you that you will be very impressed by the results. File replication software is essential to be able to copy files or the more technical term of data migration and data replication or mirroring to other computers within a network or externally, such as through the Internet to the cloud. Fairfax, VA, USA (TAM-WIRE) November 15, 2015. GuruSquad Releases GS RichCopy 360 Enterprise level Backup Software. The GS RichCopy 360 Enterprise level backup software for enterprise users, business users, and data center organizations. The GS RichCopy 360 Enterprise Backup Software includes many enhancements to its existing GS RichCopy 360 software, providing enterprise level features to home and enterprise users. GS RichCopy 360 Enterprise Backup Software is ideal for data centers, enterprises – both small businesses, and large enterprise like Fortune 500’s looking for backup software for enterprises, server backup solutions, file server backup. The features in the enterprise edition are also great for home users who want the most advanced backup features for today and tomorrow’s technology. GS RichCopy 360 Enterprise Backup Software runs on Microsoft Windows based operating systems such as XP, Vista, 7, 8 and 10. And Windows server based editions 2003, 2008, 2012, 2016. The host system must be a Microsoft Windows based system, however files on different operating systems as a network share can still be replicated. To test test the ability to transfer files to act as server backup solutions, to test file server backup functionality, GS RichCopy 360 Enterprise backup software allows transferring 5 files to be transferred to see if works for needed environment. The enterprise edition currently retails for $179 and can be purchased through the GuruSquad web site. Throughout 2015, the enterprise edition comes with a $50 saving through the companies website www.GuruSquad.com. GS Rich Copy 360 Editions provide a complete solution for computer backup, file copy, file synchronization, replication, data migration. Through the easy to use interface provided, GS Rich Copy 360 Enterprise allows file backups on home, business and corporate computers and servers. GS Rich Copy 360 series is used by AT&T, Home Land Security, organizations large and small, and home users around to world to protect their data. Visit http://www.gurusquad.com to find out more about GS RichCopy 360 Enterprise. Data (files and folders) on servers have grown exponentially in the last 10 to 15 years. An office with 150 users would have an average data of 250 to 400 GB back around the year 2000. Nowadays, an office of a 150 users could easily average 1.5 to 2TB worth of data. This is of course contributed to many reasons such as higher resolution graphics, more reliance on digital forms, departments and companies wanting to go completely paperless. This is of course considered to be great progress into the digital age but this also brings its own challenges to IT departments. Systems administrators now need to back up more data than they ever had before which possible given they have all the necessary hardware equipment. What becomes the real challenge is the time it takes to back up the data and most importantly how long it would take to restore it. It is not uncommon to see an office of 500 employees with 15TB of data. The fear is if their SAN or network shares go offline due to hardware or data corruption, then it could take a week or more to bring this data restored. This of course may not be “acceptable” or even affordable by management. Many companies have lost customers and business because of similar outages. We are certainly not prune to that. Telecommuters and people working permanently from home have become part of the norm in more and more companies every year. While there are many advantages to offering such a privilege to employees, it does present its own share of challenges to IT departments. One of the main challenges presented is how to backup remote machines as relying on the users to do it themselves almost never works out and in the event of a harddrive crash, data corruption, accidental deletion, or getting data infected with a virus, the IT department will always have to assume the responsibility of recovering the data somehow. This is a common scenario we see with many of our customers who have elected to use GS RIchCopy 360 Enterprise to overcome backing up their remote users and executive’s machines. 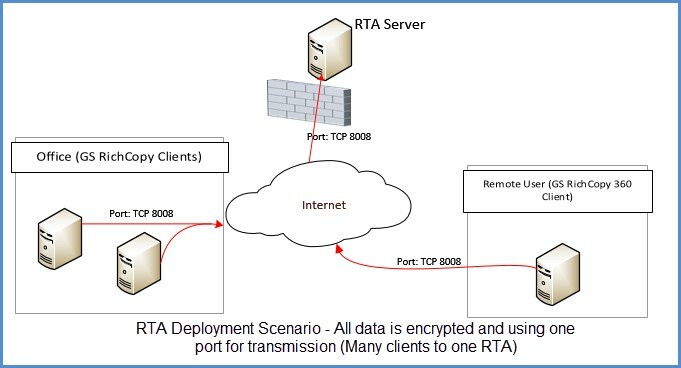 GS RichCopy 360 provides the option to copy users’ data across the internet (using AES256 encryption) to a server in their main data center which is running GS RichCopy 360 Enterprise RTA (Remote Transfer Agent). One RTA server can service many users (as many as a few hundred) given the hardware resources are available. GS RichCopy 360 Enterprise can be set to run as a service so that data replication is run at set time intervals but furthermore, it comes with Real-Time feature to capture files created\modified in-between intervals. Coupled with Byte-level replication which only sends the deltas in the files instead of sending the entire file cuts the replication time to possibly 10 to 15 minutes per day instead of 6 hours per day. GS RichCopy 360 Enterprise has the ability to copy open and locked files so that users do not have to close out their files to “let them backup”. This solution has worked for many businesses and government agencies from all sizes small, medium, large as well as fortune 500 companies. It is has been very common to see companies and organizations take advantage of deploying virtual machine instances in Amazon EC2 cloud. The main obstacle they face is how to keep the data on these servers backed up in their own company’s data center as a way of backup. It could also be the other way around where data needs to be replicated from their datacenter to VMs deployed in Amazon EC2 connected via VPN tunnel. GS RichCopy 360 Enterprise has helped many customers facing these challenges by replicating files and folders (data) between their datacenter and the Amazon AWS EC2 cloud. GS RichCopy 360 Enterprise offers features like copying files over a single TCP port where the client gets installed on the source and a lightweight agent gets installed on the destination and data is transmitted between them. To conserve on bandwidth consumption, GS RichCopy 360 Enterprise comes with byte-level replication where only the deltas in the file are sent instead of sending the whole file every time it is changed. The great news is that this solution does not only work with the AWS cloud but works with any other cloud provider for as long as both instances (datacenter and cloud) are running MS Windows operating systems. Cloud providers could be AWS, Microsoft Azure, RackSpace, …etc. MS Windows 2003 (64 and 32 bit systems are supported). Or even windows workstation OS such as Windows 7 or later. Below are two different ways to use GS RichCopy 360 Enterprise to replicate data (files and folders) from the datacenter to Amazon AWS EC2. 1) This scenario shows multiple data centers connected to Amazon AWS VM EC2 instances using Amazon VPC (VPN tunnels). 2) This scenario shows one server from datacenter replicating its data (files and folders) to an EC2 instance in Amazon AWS across the internet. (not the data transmission is using a single port which is fully encrypted using AES 256 encryption). GuruSquad finds solution to the $1.7 trillion data loss problem with backup software. GuruSquad rants and raves over $1.7 trillion EMC data loss study. They have released a GS Rich Copy 360 software and data loss white paper, looking at facts and figures, how data loss happens, and presenting several data protection solutions.